The information in this website are designed for those who study with Dr Pairach Piboonrungroj. However students from other section could benefit from this website but please re-check with your lecturer. A review of matrices and statistics, Introduction to econometric models and techniques, The ordinary least squares estimators, Testing the assumptions of ordinary least squares estimators, Generalized least squares, Dummy dependent variable models, and non linear estimators. 20% from Assignment, a report on applying multiple regression to predict an economic variable of your interest. Individually, please develop a multiple regression model to predict any economic variable using at least five predictors Then write a 1,000 words of report. 1.2 Providing supportive theories or logic. Jeffrey M. Wooldridge (2015) Introductory Econometrics: A Modern Approach, 6th Ed., 789 pp. Discover how empirical researchers today actually consider and apply econometric methods with the practical approach in Wooldridge’s INTRODUCTORY ECONOMETRICS: A MODERN APPROACH, 6E. Unlike traditional texts, this book uniquely demonstrates how econometrics has moved beyond a set of abstract tools to become genuinely useful for answering questions in business, policy evaluation, and forecasting. 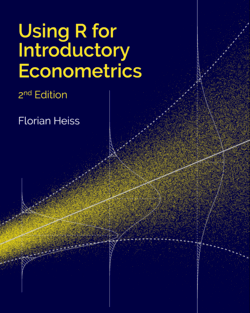 INTRODUCTORY ECONOMETRICS is organized around the type of data being analyzed with a systematic approach that only introduces assumptions as they are needed. This makes the material easier to understand and, ultimately, leads to better econometric practices. Packed with relevant applications, the text incorporates more than 100 intriguing data sets, available in six formats. Updates introduce the latest emerging developments in the field. Gain a full understanding of the impact of econometrics in practice today with the insights and applications found only in INTRODUCTORY ECONOMETRICS: A MODERN APPROACH, 6E.